Hello there friends, I am back from a little quiet period. These past few weeks I wanted to calm things down blogging wise and take a break from churning blogs out 3/4 a week. These past 9 months have been topsy turvy to say the very least so I am trying to get back in the groove of blogging following the climax of that baking competition I participated in. This post has just gone live but I actually wrote it last night.....I sit here listening to obscure Christmas music, I am trying to get in to the spirit of it all early this year as most years despite being bombarded with Christmas down my throat I still cannot get in to it all like when I was a child. I always find myself saying "it just doesn't feel like Christmas". I am also a little hypnotised right now as I write this by the smell of a roast bacon loin in the oven, blooming heck it smells good. I reckon it smells extra good because 1) its pig and pig is the best animal to grace our plate, and 2) I started back on Weight Watchers this morning. I need to shift this cake weight I have acquired before I get wed to Joanne this May. Update wise on what I have been doing with myself, these past two Saturdays I have taught a class in Kitchen Complements in Dublin City covering Gateau St Honore, Meringue Kisses, and my favourite thing to do at the moment Gingerbread Dwellings :) (my house will appear on here this week I hope). Anyhow I need to tell you all about that picture above, that's the Mulberry Garden in Donnybrook and below is my review of the restaurant. Last Friday evening I had the pleasure of visiting the Mulberry Garden. I have one of my good friends Pa to thank for the pleasure, you see Pa bought myself and Joanne a voucher for our engagement. We were both delighted to be finally going to eat Tom Doyle's amazing food. Our booking was for 6.30pm, and we arrived to a lovely welcome and warm haven to the cold outdoors. It wasn't long before we made our order and as ever rather than reviewing what Joanne ate I will just focus on mine. I ordered Crisp Confit Duck Smoked Almonds, Liver Cream, Chicory Marmalade, Toasted Brioche, Orange & Tarragon Dressing as my starter and for mains I decided on Roast Atlantic Plaice Wilted Sea Beet Leaves, Galway Oysters, Cauliflower, Lemon Gnocchi, Champagne & Chive Cream. I also got a dessert but will tell you about that the end. Before I start let me tell you about their gorgeous bread, it was so good and we even received two rounds of it. Yes the Mulberry Garden already had gone up in my estimation, I love any restaurant instantly who plies me with great bread. 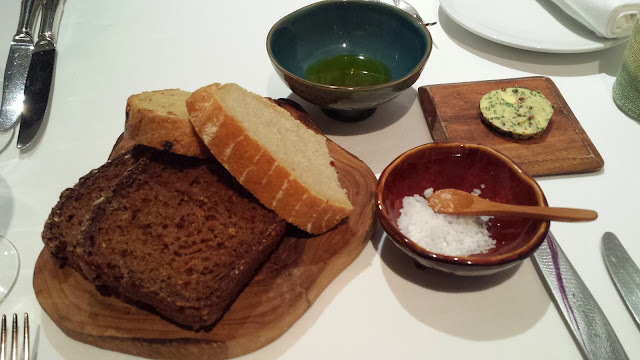 Glorious bread with beautiful butter from the company Improper Butter which made the bread even more delicious. Firstly the dish was very well presented so clean and elegant. My god it was yummy, the confit with the liver cream was divine and the chicory marmalade was so tasty, I have had chicory so many times before but never as a marmalade. The whole dish was the perfect start to the evening, that's if we are ignoring the amazing bread course hehe. We both opted for the plaice and yes we made the right choice! it was mega. 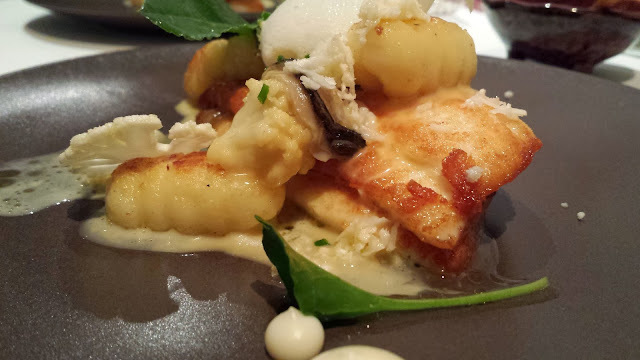 The plaice was truly stunning so fresh and I especially loved the gnocchi I could eat a bowl alone of the gnocchi. Oh and of course Joanne hates oysters so I had 4 oysters to myself , amazing oysters from Galway, I could not be any happier finishing this course. Two amazing dishes, how had I never been here before and was thinking Pa you are a gent for this voucher. To finish the meal we got ourselves a Blackberry Parfait with Apple Sorbet with Blackberry Macaron and Honeycomb. 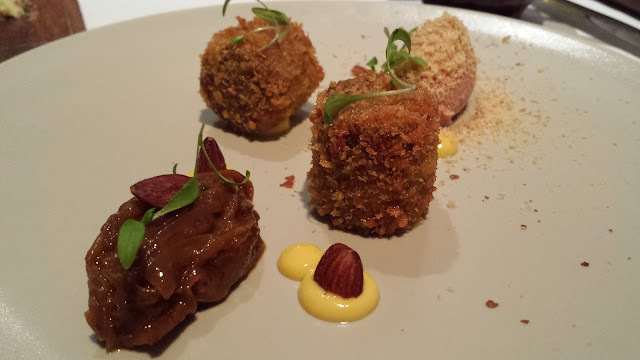 Its rare we go for dessert but we had the voucher and how it works in Mulberry is you get 3 courses for €40 each so may aswell go the whole hog. The dessert was the final knock out, by god it was good. Blackberry and apple are perfect partners it was like a symphony, truly scrumptious. 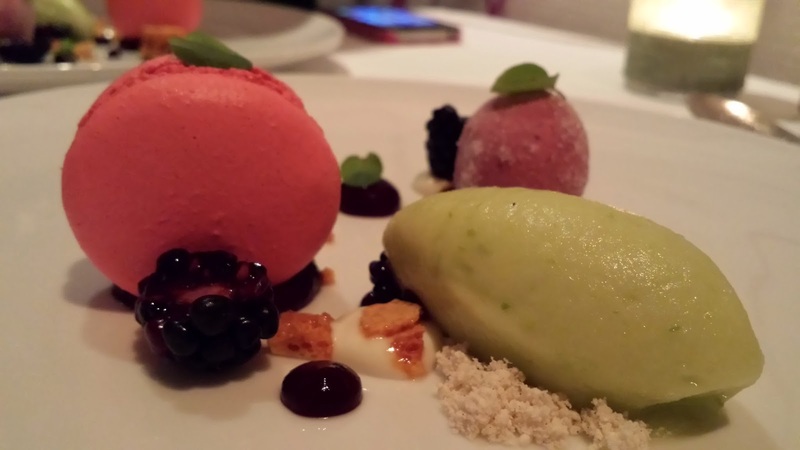 The apple sorbet was spectacular and look at that shiny macaron, a great ending to a perfect meal. 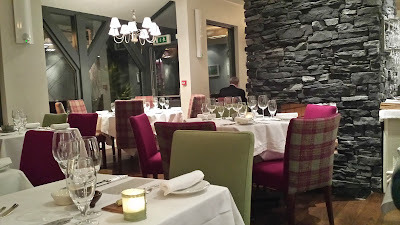 The entire experience at Mulberry wowed us both, they have a marvellous setting with fantastic staff and chef in Tom Doyle who is a genius. Go visit them soon, it might not be long before Michelin come knocking on Tom's door. Visit them you will not be disappointed. PS: I will leave you with mine and my brother's favourite Christmas song.